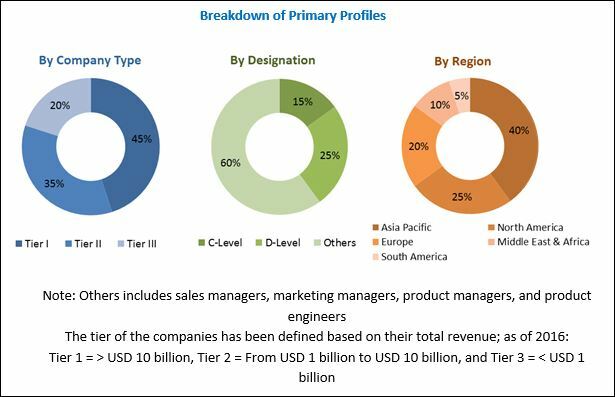 [147 Pages Report] The global load break switch market was valued at USD 2.19 Billion in 2017 and is projected to grow at a CAGR of 6.16%, during the forecast period, to reach USD 3.12 Billion by 2023. Refurbishment of aging power infrastructure, increased investment in the power distribution sector, and focus on renewable power generation are the major factors driving the load break switch market. Digitalization of electric utilities is one of the major opportunities for this market. The base year for company profiles is 2017. Whenever information was unavailable for the base year, the prior year has been considered. To track and analyze competitive developments such as contracts & agreements, expansions, new product launches, and mergers & acquisitions in the market. This research study involved the use of extensive secondary sources, directories, and databases such as Bloomberg Businessweek and Factiva to identify and collect information useful for a technical, market-oriented, and commercial study of the global load break switch market. The primary sources include industry experts from core and related industries such as commercial and manufacturing & process, preferred suppliers, manufacturers, distributors, technology developers, standards and certification organizations of companies, and organizations related to all the segments of this industry’s value chain. The points below explain the research methodology. After arriving at the overall market size, the total market has been split into several segments and subsegments. The figure given below illustrates the breakdown of primaries conducted during the research study on the basis of company type, designation, and region. Major manufacturers in the load break switch market include ABB (Switzerland), Siemens (Germany), Schneider (France), GE (US), and Eaton (Ireland). The manufacturers such as Socomec (France), Rockwell (US), and Ensto (Finland) either participate in the supply of raw materials/auxiliary components or directly sell load break switch through authorized distribution channels. The distributors also provide replacement and maintenance services for switch components and installation of load break switches. The global load break switch market is estimated to be USD 2.32 Billion in 2018 and is projected to grow at a CAGR of 6.16%, from 2018 to 2023, to reach a market size of USD 3.12 Billion by 2023. The market is driven by factors such as refurbishment of aging electrical infrastructure and increasing investment in power distribution sector. The growing renewable-based power generation is expected to boost the demand for load break switches. The emerging markets in Asia Pacific present a great opportunity for the load break switch market due to significant government initiatives to promote renewable energy generation and refurbishment of the aging electrical infrastructure. The report segments the load break switch market, by type, into gas-insulated, vacuum, air-insulated, and oil-immersed. The gas-insulated segment is estimated to lead the load break switch market in 2018. It is also projected to grow at the fastest rate during the forecast period due to the features such as easy installation, long life cycle, and high electrical & mechanical endurance. In Asia Pacific, the major demand for gas-insulated load break switches is from the electric utilities. This would boost the overall gas-insulated market. Based on installation, the outdoor segment accounted for the largest market size in 2017. Outdoor switches can also be deployed with outdoor distribution transformers rating up to 36 kV. These switches come with flexible installation and mounting configurations, which include pole top, mid-pole horizontal, and mid-pole vertical. These factors are expected to drive the outdoor segment of the load break switch market, by installation. The load break switch market has been analyzed on the basis of six regions, namely, Asia Pacific, North America, Europe, the Middle East, South America, and Africa. The market in Asia Pacific is expected to lead the global load break switch market by 2023. The market size in this region can be attributed to the increasing focus on the power distribution sector, of which load break switch is a part. Countries such as China, Japan, and India are the key markets for load break switches in Asia Pacific. The refurbishment of aging electrical infrastructure in the region is expected to drive the market in Asia Pacific. The declining investments by oil & gas companies have adversely affected the demand for medium -voltage equipment used in the power distribution network as they are used in the oil & gas industry, where substations and transformers are located remotely for power distribution. Due to declining investments, no new projects are carried out in the oil & gas industry. Hence, cancellation of new oil & gas projects would result in no new oil & gas plants, wherein medium-voltage products such as load break switches are deployed. Hence, this would result in a decline in the market for oil & gas end-users. 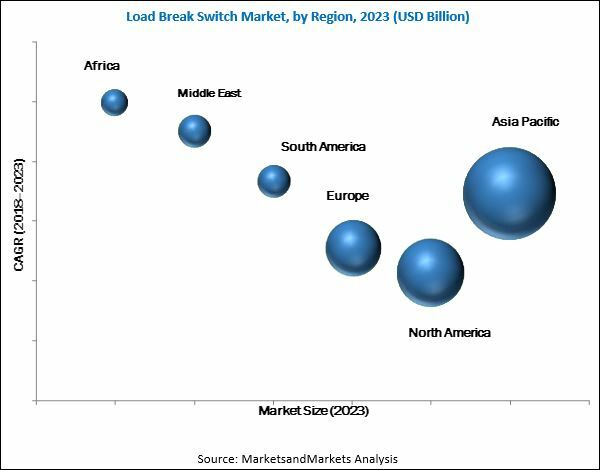 The key players in the load break switch market include GE (US), Siemens (Germany), Schneider (France), Eaton (Ireland), and ABB (Switzerland). New product launches was the most commonly adopted strategy by the top players in the market from 2013 to 2017. It was followed by contracts & agreements, and investments & expansions, and mergers & acquisitions.